Whether they are trophy hunting or just craving deer for supper, the question “How Much Does A Deer Weigh?” is one that will always spark a hunter’s interest. It is a question to do with their hunting prowess. The size of the catch reflects the hunter’s abilities out in the wild. In the U.S. Deer is among the largest game and one of the most hunted. While most people hunt the animal for its meat-known as venison, harvesting the animal in heavy numbers also helps to keep their population balanced. Since they are a popular candidate for hunting, the woods where you find the best full-grown bucks can quickly get crowded. As such, you want to find an area with little hunting pressure. Sometimes this may mean traveling to popular hunting areas like Colorado, Kentucky, or Maine. Deer can multiply to exponential numbers and this abundance makes it very easier to obtain a hunting permit. 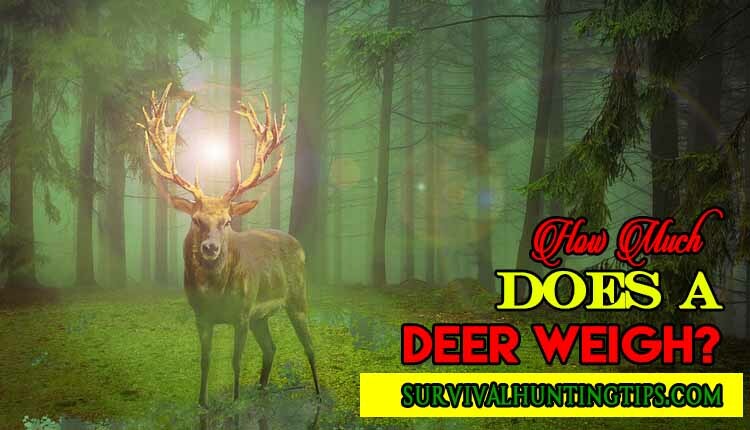 If you are here because you intend to hunt deer on your next time out in the wild then you will like all the good info you find here. Below is a rundown of what different parts of the animal weigh. How Much Does A Deer Weigh In Blood? How Much Does A Deer Weigh In Bones? The question here is, How Much Does A Deer Weigh in live weight. A fully-grown buck of about six years looks meaty out in the wild, and if you are, lucky enough the antlers can make for a worthy trophy. Bucks usually have a weight ranging from 130 to 300 pounds. However, there are hunters reported to have caught bucks weighing over 350 pounds. A doe weighs a bit less, they range from 90 to 200 pounds. This is what we consider as live weight. The deer has its weight distributed quite evenly between the regions you can consume and the non-meat areas. Once you finish preparing the meat, you may remain with edible meat that is half, or in most cases less than half the total live weight. The average weight of a buck is 160 pounds, and blood takes up 5% of this total weight. That means that the average buck has about eight pounds of blood. On average the does weigh about 140 pounds. Their blood also accounts for 5% of their total body mass, which is about 7 pounds. Hide weight takes up more percentage weight in relation to the total weight than blood. Typically, it takes up about 8% of the deer’s total mass. For a doe weighing 140 pounds, this would put the weight of the hide at around 11.2 pounds. Since the buck is bigger, you can expect a much heavier hide. A 160-pound buck would typically have a hide weighing about 14.4 pounds. so if you are wondering How Much Does A Deer Weigh without the hide; the hide takes up close to 9% of the buck’s total weight. Thanks to a natural diet that does not supply fat as well as their behavior, deer don’t have too much fat. Besides, they also walk a lot foraging for grass as opposed to domesticated animals that often zero grazed burning calories in the process. They are always alert to danger, which they sense quite speedily due to their super-sensitive ears and noses. That means they are always running away from hunters, which gives them all the exercise they need thus keeping them lean. A pound of venison has much lesser fat than pork or beef. In fact, it is one of the main reasons many people who enjoy hunting go for deer meat; it’s great tasting, free-range meat with very little fat. Bones take up around 13% of the doe’s body mass. A 140-pound doe has roughly 18 pounds of bone mass. The bucks have a slightly lower percentage of bone mass varying between 11.5% and 12.5%. This means that a buck weighing 160 pounds has an average bone weight of 19-20 pounds. You have tracked your animal and shot it, now it is time to field dress it. The carcass should be field dressed as soon as possible to preserve the meat. Bacteria infestation can happen quickly if you let the carcass remain with its insides for too long. Once you get to the carcass, gut it, and remove the internal organs so that it is lighter. Most hunters want to weigh their animal at this stage, after removing the innards. This is the field dressed weight. Field dressing is quite straightforward and does not take much time if you have a sharp enough knife. Once you have the animal checked out and weighed, what you will have is the field dressed weight. Hunters are always curious to know what their deer weighed on the hoof. There is a way of determining the deer’s live weight from the field dressed weight. However, this method does not always give the exact weight because you have to take into account the innards whose weight will vary from animal to animal. For the most part, this guide gives an estimate or the deer’s live weight. If you apply this principle for a buck with a field dressed weight of 150 pounds, the estimated live weight would be 189 pounds. You can also find different weights using the girth method. This way is much simpler as all you have to do is measure the animal’s girth and compare it to a table listing other weights for different girth measurements. When it comes to deer hunting, there are various weights to consider. All of these vary with the animal’s age, what it has been feeding on as well as the environment that has influenced the animal’s growth. So How Much Does A Deer Weigh? it’s not only a matter of pride but also important in determining what kind of hunting gear you need. Your calculations this time will help to get you better prepared for your next adventure in the wild and whether you will need other hunter friends to accompany you. Is there anything more you would like to know about deer weight? Ask away in the comments section and add whatever information you would like to share.